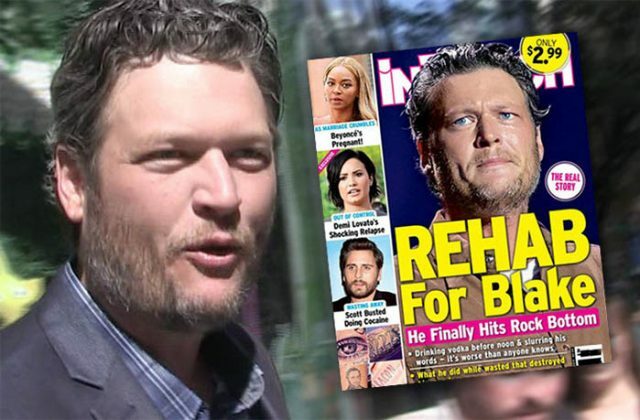 INTOUCH MAGAZINE SHELLS OUT MASSIVE PAYOFF TO MAKE LAWSUIT GO AWAY! As if we did not already know, InTouch Magazine is known in the reporting industry as a far fetched tabloid. According to docs filed Thursday, Blake and the magazine are asking the court to dismiss the defamation lawsuit he filed in 2015. The magazine ran a cover story in September 2015 declaring the country star had hit “rock bottom” and was drinking vodka before noon. This is not the first or will be the last time, that InTouch was/will be busted for providing fake news to people standing in line at the grocery store. ShowbizSpy sources are telling us the settlement amount to make the lawsuit go away was in the area of 10M cash, and a clause to not report on Blake again unless his rep is notified in advance. According to local law firm Joseph, Hollander & Craft this was a slam dunk case for Blake, due to the “reporting text” (claims of facts know by InTouch reporters) Message learned here… Make up facts/sources and Blake will make you pay! Next articleBEN AFFLECK & JENNIFER GARNER MARRIAGE OVER A LONG TIME AGO!